IncrediFlash Intro and Banner Studio is a very easy and helpful program to create a flash animated intro and banner without any flash knowledge. Select a background color, a customizable gradient color (up to 8 colors can be added) and a background image with various style such as stretched, fit and tiled. Add border, customizable preloader, mute button and skip button. Easily position, rotate and resize your text by simply dragging handles in the preview window. See the changes you have made instantly in the preview window. 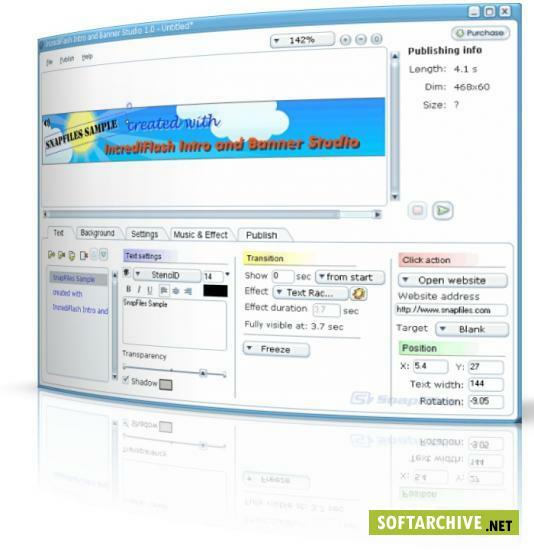 IncrediFlash Intro and Banner Studio allows you to select a WAV/MP3 file as a background music. Use the background image and music compression settings to adjust the quality versus published file size. Lossy (JPEG) and lossless (GIF) compression format are supported. Attach a click action to any text object and background. IncrediFlash Intro and Banner Studio allows you to select a static/animated background with a customizable colors from a library. Choose from a library of animated layer effects to enhance your animation. * Recommended: 800 MHz CPU and 256 MB RAM.